The Style Spy | How Lucky Can Anybody Be? Happy New Year! I hope 2015 was a great one for all of you, and that 2016 will bring you much joy and happiness. Personally, I’m sad to see 2015 go. I had one of my best years ever—a new job, great graphic design classes, a wonderful trip overseas, and some fantastic new friendships. With all the changes in my professional and personal life, I didn’t have as much time for entering contests in 2015. However, I did have some memorable wins earlier this year and December ended with two wins; a great way to end 2015. Both were absolutely delicious! 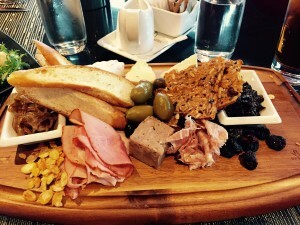 The charcuterie plate delighted us with its array of cheeses, prosciutto, pate, dried cranberries, and more. 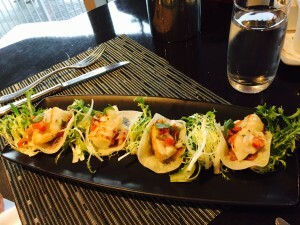 The fish tacos were also very unique, as they were wrapped in jicama and had a light and fresh flavour that we both enjoyed. Our server was very friendly and the restaurant had lovely Christmas decorations that put us in the festive spirit for some crafting at the market. My last prize of the year was a CND Vinylux nail polish set which I won via an online holiday giveaway launched by The Style Spy. I will be receiving my prize in January. If you’d like a preview of what’s due to arrive at my doorstep in the coming weeks, click here. This final prize is worth $137, making my total winnings for the year $412. So ends 2015. A year I’ll look back on with fondness. 2016 promises to be an exciting one as well, with more changes coming my way! Here’s hoping for some more wins too!